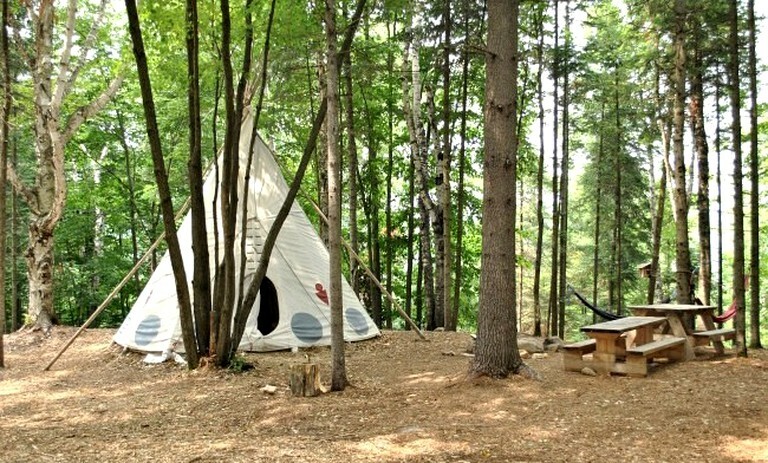 This simple, cozy, woodland tipi rental near Montreal, Quebec, can accommodate two guests and is perfect for couples looking for a forested, romantic retreat. Duvets and wood are supplied if staying in the tipi during the winter, but for the rest of the year, no other bedding is provided. 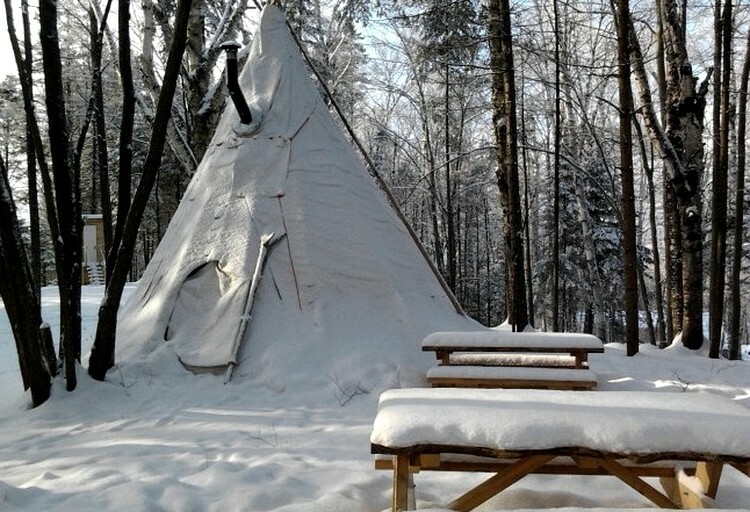 The tipi has a spruce wood floor set up on an isolated platform. There is a kitchen area with a wood-burning fireplace and a campfire for summer, which comes with grills and utensils for barbecuing. 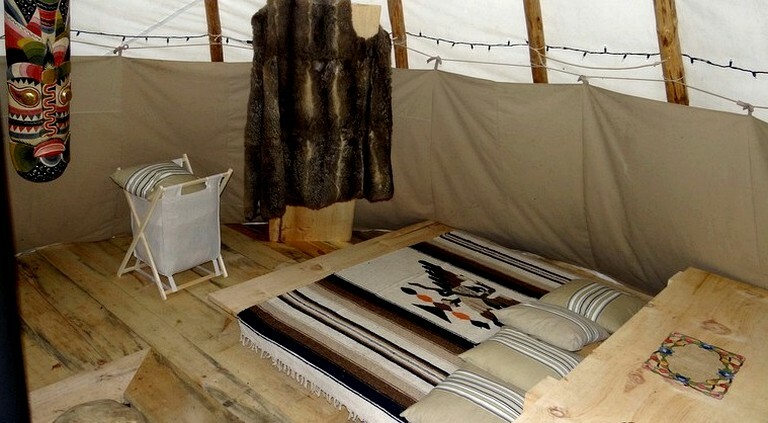 The table, cushions, and kitchen counter are all strategically placed throughout the tipi's structure. The beds are removable and raised. There are two wooden picnic benches outside the tipi which are ideal for a 'al fresco' dining, and summer picnics. This glamping property has a main building open to all guests, a log cabin house, which has electricity and heating. There is also a large wooden stove which can be used to cook meals. In this building there is portable running water (both hot and cold) and a fully-equipped kitchen, furnished with an oven, cooking utensils, a large barbecue, and more. Glampers are encouraged to make use of the coffee machine and fondue set. Electrical outlets are also available for guests to charge small electronic devices. The bathroom facilities also have both hot and cold water, there are two toilets (toilet paper is included). The shower is approximately $1.53 USD ($2 CAD) for five minutes of usage. There is a wooden shed on site that has firewood and kindling for guests. There is free Wi-Fi for all guests of this main lodge, simply ask for the password. Although an initial supply of firewood will be provided free of charge, there is an extra firewood charge of $3.80 per bag. 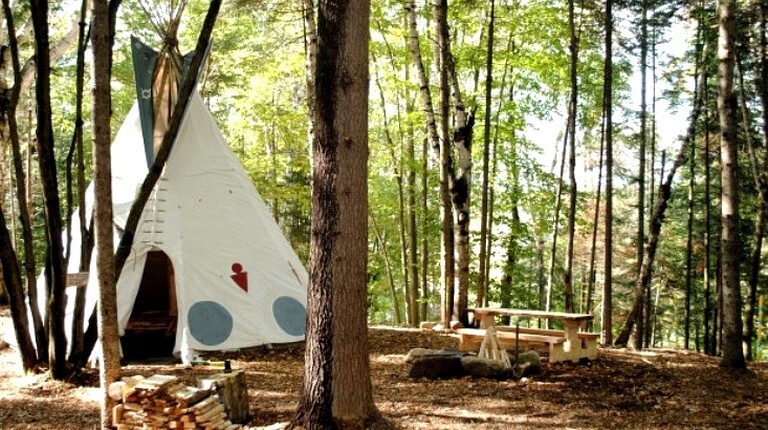 The host suggests that guests bring their own sleeping bags, there are a limited number of sleeping bags with a cotton insert which can be rented from the glamping site. If this service is required, please notify the host in advance. The forest is a great place for children to explore, play, and get creative. There is an obstacle course which keeps kids entertained for hours, and through the forest there are a range of different walking trails to suit all ages and capabilities. In the wintertime, thrill-seekers will love spending a day tacking the Nordic Walking course, and trying cross-country skiing. Equipment is not provided by the lodge. There is much to be explored in the nearby village of Saint-Saveur, with restaurants and bars. The area offers fantastic skiing opportunities, including night-time skiing and après-ski establishments. Pets are allowed at this glamping site, though they are not allowed to go on the beds in the accommodations. Pets cannot be left alone at any time and must be cleaned up after. After 10 p.m., guests are asked to keep noise to a minimum.